Lindsay & Rob are Fun In The Sun Weddings’ newest newlyweds! 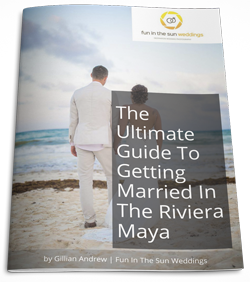 Although the groom didn’t stick to the plan with his proposal, he and his bride kept their eye on the prize for their perfect destination wedding in Riviera Maya, Mexico…and everything turned exactly the way they wanted. Lindsay and Rob met in much the same way we here at Fun In the Sun Weddings did: in a bar, on Granville Street, in Vancouver, Canada! When the time came to put a ring on it, Rob had planned an elaborate proposal on a trip to Thailand…BUT then he panicked on the way out the door to the airport and proposed to Lindsay in the hallway of their home instead! However, when it came to planning their wedding, this bride and groom would not be swayed from their dream of getting married on the beach. 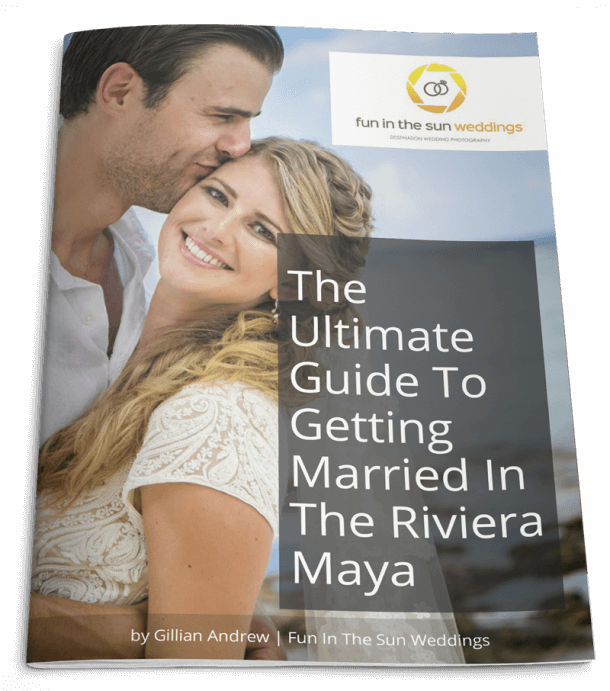 The settled on a destination wedding in Riviera Maya, Mexico when the Grand Sunset Princess, the first resort they had ever traveled to as a couple, popped up in their search. They saw it as a sign. Knowing that they were asking a lot of their friends and family and that sometimes people kinda hate you for having a destination wedding, they did their best to make sure that all of their wedding guests had an amazing holiday, without compromising their big day in the process. They stuck to their vision and were not swayed by outside opinions. After the fact, Lindsay says that her favorite moment from her wedding day was seeing everyone have such a good time! Use a few flowers from the centerpieces and bouquet as decor for the cake. Floral arrangements used for the ceremony were later moved to the reception tables. Their beach wedding turned out exactly as they had planned, and they wouldn’t change a thing. The brides’ advice for those getting married on the beach? Your wedding is only one day in the rest of your lives together….don’t stress about it! Allow for some fluidity in your planning and trust in your decisions when you make them. Most importantly, HAVE FUN! Lindsay and Rob, it has been so fun sharing in your special day! We wish you every happiness in your marriage, and hope you stick to the plan to get back here again soon! Congratulations! Want to know more about the Grand Sunset Princess resort? Read unbiased reviews on Tripadvisor here.